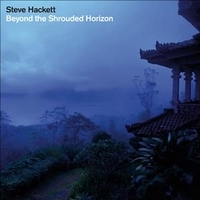 Guitarist Steve Hackett is a living legend, now the legend is back with a new studio album called Beyond The Shrouded Horizon. The album offers 13 tracks and kicks off with Loch Lomond, a tune with a melancholy opening. The atmosphere changes... the song gets a folky edge and is bombastic at other passages, but it's Hackett's warm voice which enchants you. The Phoenix Flow features Hackett's guitar play and is more an interlude. Followed by another interlude - Wanderlust which is an acoustic one. The next song is Til These Eyes which is a catchy, symphonic art rock tune with acoustic guitar. One of my favorites is Prairie Angel, a powerful prog rock track. A Place Called Freedom has a Yes-ish edge... Songs like Between The Sunset And The Coconut Palms show reminiscences to his past... A beautiful prog rock track with symphonic elements. Waking To Life has Oriental elements and features Amanda Lehmann on lead vocals. The track is a bit faster, has a special sound due to the Oriental elements but also has a poppy edge. With Two Faces Of Cairo he continues his journey to the Orient and presents a dramatic instrumental. After another interlude Mr. Hackett presents Catwalk, a bluesy heavy rocker, one of the highlights of Beyond The Shrouded Horizon - at least for me. The last track is called Turn This Island Earth and it's a long tune which has embedded different elements / influences incl. some classic compositions. Steve Hackett is an extraordinary guitarist and knows the business, so expect a perfect production and high-class musicians joining him on this release. Musically it's surely a matter of taste, but if you like his previous releases, you won't be disappointed!